In this, his greatest surviving landscape, El Greco portrays the city he lived and worked in for most of his life. The painting belongs to the tradition of emblematic city views, rather than a faithful documentary description. The view of the eastern section of Toledo from the north would have excluded the cathedral, which the artist therefore imaginatively moved to the left of the Alcázar (the royal palace). Other buildings represented in the painting include the ancient Alcántara Bridge, and on the other side of the river Tagus, the Castle of San Servando. We know remarkably little about the circumstances around the creation of this masterpiece, El Greco’s greatest surviving landscape. There is a possibility that it was still in the artist’s studio when he died, for in the inventory of his possessions drawn up in April and July 1614 are found three landscapes: a “Toledo” and “two landscapes of Toledo” (f. 1402: Un toledo; f. 1403: dos paises de toledo). What must be the same three paintings recur in a subsequent inventory drawn up in August 1621/22 of the possessions of El Greco’s son, Jorge, in which the measurements for the first translate to about 41 x 66 1/8 inches, and for the other two to about 43 3/4 x 43 3/4 inches. (f. jU clxxx̊i: 137, 138: Dos paises de T[oled]o de bara y terzia en quadrado; 172: Un lienzo de T[oled]o de dos baras de largo y bara iquarta de alto). The 1621 inventory lists six further landscapes (nos. 146–48 and 210–12), either just begun or unfinished, but neither artist nor subject is included. (For the inventories, see Javier Docampo, José Riello, La Biblioteca del Greco, Madrid, 2014, pp. 224, 233.) 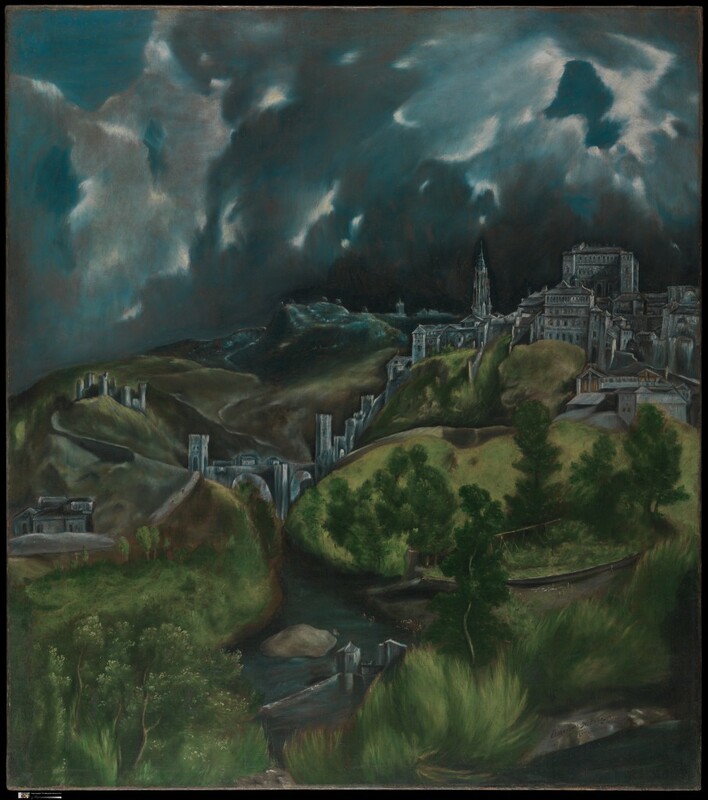 The larger, horizontal canvas is usually identified with the View and Plan of Toledo in the Museo de El Greco, Toledo (see Additional Images), though that work actually measures 52 x 89 3/4 inches. The MMA picture could conceivably be one of the smaller, square pictures. In yet another inventory, this time of the collection of the artist’s friend and patron Pedro Salazar de Mendoza (1549–1629) drawn up in 1629 are listed two paintings of Toledo by El Greco: “a picture of the city of Toledo with its plan” and “a landscape of Toledo looking towards the Alcántara bridge.” The first could, again, possibly be the View and Plan in the Museo de El Greco while the second description would accord with the viewpoint seen in the MMA canvas. In an inventory drawn up between 1632 and 1639 are found two landscapes by El Greco in the collection of Pedro Lasso de la Vega Niño y Guzmán (1559–1637), 1st Conde de los Arcos, a major collector who owned at least seven paintings by El Greco, including the Portrait of a Cardinal in the MMA (29.100.5). They are listed among the paintings in his castle at Batres as a “piece [showing] Toledo and the other a monastery of the Great Camaldolese” (dos medianos [cuadros] de Domenico Greco, el un retrato de un pedazo de Toledo, el otro retrato del monasterio de la gran Camáldula; see Refs.). The second is certainly the Allegory of the Camaldolese Order (Instituto de Valencia de Don Juan, Madrid)—which is an allegory incorporating a landscape—and the other may well be the MMA painting, since it belonged to a descendant of the Conde de los Arcos when it was shown (together with the Portrait of a Cardinal) to Louisine and H. O. Havemeyer in 1901; Mrs. Havemeyer acquired it only in 1909, after her husband’s death, from the French dealer Durand-Ruel. The information provided by these various inventories presents a number of problems, not least of which is the issue of how many landscapes with a view of Toledo El Greco painted and when and how the ones listed changed ownership. Because of these uncertainties, our understanding of the origin and meaning of the two surviving landscape paintings—the View of Toledo and the View and Plan—remains largely speculative. Certainly, they respond to very different objectives: one setting out to document the city in cartographic terms, the other evoking it through a selective arrangement of its most characteristic features. As Brown and Kagan (1982) noted, the MMA painting belongs to a tradition of emblematic city views and derives its potency precisely from the representational license it takes. As with El Greco’s finest portraits, its approach is interpretive rather than documentary: it seeks to portray the essence of the city rather than to record its actual appearance. Both here and in the View and Plan the city is shown from the north, except that in the MMA canvas El Greco has included only the easternmost portion, above the Tagus river. This partial view would have excluded the cathedral, which he therefore imaginatively moved to the left of the dominant Alcázar or royal palace. A string of buildings descends a steep hill to the Roman Alcántara bridge, while on the other side of the Tagus is the castle of San Servando. Another cluster of buildings appears on a cloud-like form below the castle. In his View and Plan El Greco shows the Hospital of Saint John the Baptist (the Tavera Hospital) raised on a cloud, and explains in an inscription that he used this device so that the hospital would not obscure a view of the city gate. Taking up this line of reasoning, Brown and Kagan have suggested that in his cluster of building in the MMA picture El Greco may have wanted to represent the Agaliense monastery where Saint Ildefonso, the patron saint of Toledo, went on retreat. He may have felt that a depiction of this monastery complex was crucial to a spiritual portrait of the city. That the buildings are on a cloud has been questioned since figures can be seen walking about, but there is really no other explanation for the form. Kagan identifies Pedro Salazar de Mendoza, who either owned both pictures by 1629 or had two similar ones, as crucial to the genesis of the two paintings. He was administrator at the Tavera Hospital and his interest in maps might explain the character of the View and Plan. Similarly, his interest in Saint Ildefonso and his attempt to determine the site of the Agaliense monastery used by the saint as a retreat could be equally important for the View of Toledo. However, it is important to bear in mind El Greco’s practice of painting variants of his most popular or important compositions. The inventories suggest that this practice extended to the landscape views of Toledo. Interestingly, we know of two versions of his imaginary landscape showing the Camaldolese community seen against a mountainous backdrop: one in the Instituto de Valencia de Don Juan, Madrid, and a larger version in the Colegio del Patriarca, Valencia. Moreover, El Greco must have had a painting of Toledo in his workshop that could be used for reference when he included the city in the backgrounds of other compositions. 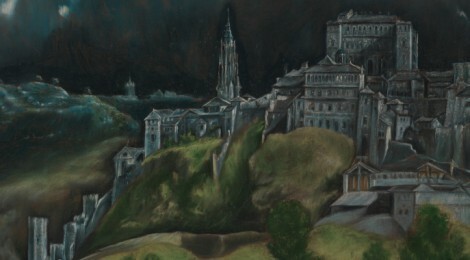 For example, a view of Toledo appears in the background of El Greco’s altarpiece in the Capilla de San José, Toledo, which was commissioned in 1597. The San José altarpiece shows Saint Joseph with the infant Christ, and an inscription adjacent to it refers to the Christ Child as the ruler of Toledo: the city thus appears symbolically as his dominion. Another version of the View of Toledo, though without the Alcázar, appears in The Virgin of the Immaculate Conception (Museo de Santa Cruz, Toledo; see Additional Images), which was commissioned in 1607. In that work the city, significantly deprived of the building that served as the seat of secular power, is transformed into one of a number of Marian symbols in the landscape. It has sometimes been conjectured that the View of Toledo is itself a fragment of a religious picture. Although this is incorrect—the canvas has been trimmed but there is no reason to believe it to be a fragment—the impulse behind it is intimately linked with the altarpieces and it seems likely that the View or a picture very like it served as a model for the ecclesiastical works and thus dates to about 1597.